Apply generously and evenly to all areas 20 minutes before sun exposure. No need to rub in. Reapply frequently to maintain protection and also after swimming and towel drying. Do not spray directly on face. Spray on hands to apply to face. Use in a well-ventilated area. For external use only. Avoid contact with eyes and clothes. Do not stay too long in the sun even while using a sun protection product. Keep babies and young children out of direct sunlight. Use clothing and sun protection products with a very high spf (higher than 25) for babies and young children. Over exposure to the sun is a serious health threat. Reducing applied quantity will significantly lower the level of protection. FLAMMABLE. Pressurised container. 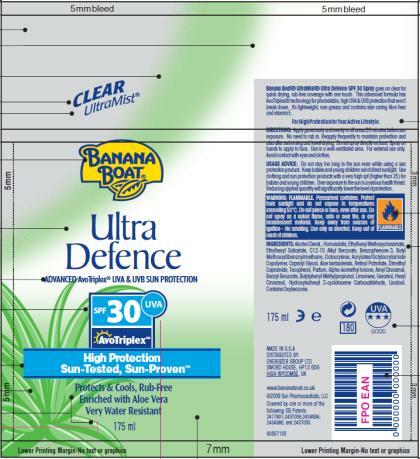 Protect from sunlight and do not expose to temperatures exceeding 50°C. Do not pierce or burn, even after use. Do not spray on a naked flame, onto or near fire, or any incandescent material. Keep away from sources of ignition â€“ No smoking. Use only as directed. Alcohol Denat., Homosalate, Ethylhexyl Methoxycinnamate, Ethylhexyl Salicylate, C12-15 Alkyl Benzoate, Benzophenone-3, Butyl Methoxydibenzoylmethane, Octocrylene, Acrylates/Octylacrylamide Copolymer, Caprylyl Glycol, Aloe barbadensis, Retinyl Palmitate, Dimethyl Capramide, Tocopherol, Parfum, Alpha-isomethyl Ionone, Amyl Cinnamal, Benzyl Benzoate, Butylphenyl Methylpropional, Limonene, Geraniol, Hexyl Cinnamal, Hydroxyisohexyl 3-cyclohexene Carboxaldehyde, Linalool.